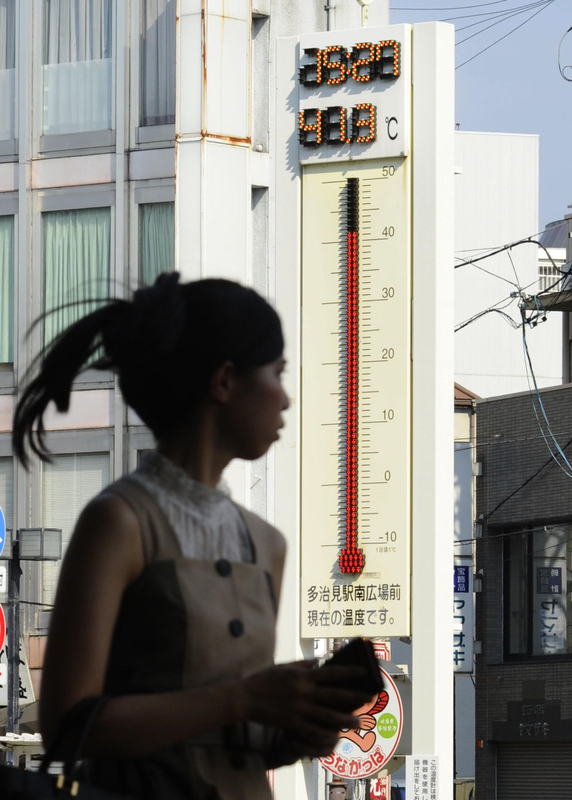 Twelve people died and nearly 10,000 people were taken to hospitals for heat exhaustion or heatstroke during the week through last Sunday, as a heat wave continued to scorch wide areas of Japan, the government said Wednesday. 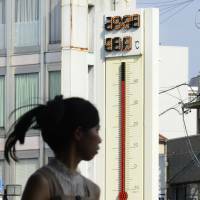 Temperatures soared to more than 35 degrees, with cities in central Japan seeing the highest levels this year at about 40, the weather agency said. As intense heat is expected to continue, the Meteorological Agency has warned people to take precautions, such as drinking sufficient amounts of water. According to the Fire and Disaster Management Agency, the heat sent 9,956 people to hospitals, 3.7 times higher than that of the previous week. A Kyodo News tally showed more than 5,000 people were taken to hospitals during the three-day weekend. For Wednesday, temperatures climbed to 40.7 in the city of Tajimi in Gifu Prefecture, and the city of Mino in the same prefecture reached 40.6. The last time such temperatures were reached was August 2013. By prefecture, Osaka saw the largest number of people sent to hospitals at 752 people, followed by 704 in Tokyo and 687 in Aichi Prefecture. Of the 9,956 people, nearly 190 needed to be hospitalized for more than three weeks. People aged 65 or older accounted for 46.1 percent of the total. Among the fatalities last week was a 6-year-old boy. The first-grade elementary school student in Aichi Prefecture was attending an outdoor class for about two hours with his teacher and classmates at around noon on Tuesday. The temperature was about 33 at that time. The heat has also continued to make it difficult for relief operations in regions ravaged by the recent flooding and landslides. Although more than a week has passed from the downpour, more than 10 people remain missing in the prefectures of Hiroshima, Okayama, Ehime, Osaka and Nara, according to a tally. About 4,800 people in 16 prefectures had evacuated to shelters, according to the National Police Agency. In the three hardest-hit prefectures — Okayama, Hiroshima and Ehime — a total of 813 people were taken to hospitals last week, including volunteers for removing and cleaning up debris. In the areas hit by the downpour, Ozu in Ehime Prefecture logged 35.9, while Kurashiki in Okayama Prefecture and Higashihiroshima in Hiroshima Prefecture recorded 33.9 and 33.4, respectively. Of the 927 monitoring points nationwide, 185 points logged 35 or higher on Wednesday, the Meteorological Agency said. In Osaka Prefecture, firefighters took nine female students to hospital at about 1 p.m. after receiving an emergency call from the school. Three are apparently in serious condition, they said. It was around 38 at just past 2 p.m. in Osaka. The Tokyo Fire Department said it received about 2,900 emergency calls the previous day, a record high for a single day since it started emergency services in 1936. The Environment Ministry, which releases a color-based map on its website to convey heat exhaustion or heatstroke risks, has decided to change the colors to make it easier to read for people with color vision deficiency.